Emplacement, emplacement, emplacement! Ce populaire face à l'océan, 3 chambres, 2 salles de bain unité de niveau supérieur offre une vue sur l'océan dégagée et un accès facile à la plage. Le Pier de Johnnie Mercer avec des arcades et de la pêche est juste un nord de bloc. "The Loop", une voie pavée 2. 5 mile autour de l'île voisine de Port et du centre ville Wrightsville Beach est accessible à pied de l'Est Henderson Street. Obtenez un peu d'exercice et profiter d'une visite panoramique de la région! Pour les grands rassemblements réservent les unités de niveau inférieur # w031 (VRBO: 3677257) pour un total de 6 chambres. Off-street parking pour 2-3 voitures. Occupation: 8. Interdiction de fumer. Pas d'animaux de compagnie. We have stayed here before and love the deck with ocean view and rockers. We know the unit is very basic but we had several problems this year. The AC did not function properly and was not fixed before we left. A few days it was over 80 degrees in our unit. One day there was a plumbing problem in the unit below us. When we came in from beach that afternoon, we had to wait until after 7:00 to use water. Not fun as we were hot and could not shower after coming in from beach. Beds old and stained. One box spring was broken making bed unusable. A post in railing was missing on deck. Even after advising Bryant they did not repair it while we were there. Fortunately we had no small children. Window shades held up by shoe strings. Lamps falling apart. Because of the AC and plumbing issues, we felt we deserved at least a 2 day credit. After being long time Bryant customers, we were given a fraction of 1 day as a credit. Very disappointed in Bryant and owner for not making this right. Will not be using Bryant again. Tim. We apologize for the inconvenience you encountered during your stay. Though there was an AC issue, we had the unit recharged multiple times to make sure it was pumping cold air for you and your family and we also delivered fans. The AC unit required a new coil that had to be ordered and has since been fixed obviously. Yes - during your stay the water was turned off for a few hours. We realize the timing of it impacted your family washing off after enjoying the beach, but it was off for only a few hours and was an unforeseen emergency. Sadly - sometimes systems break that require fixing. We wish we could have avoided this for you and your stay, but that wasn't the case. We discussed this matter with our management team and the owner and offered what we felt was fair compensation,however, we realize you feel differently about this. However - we are shocked with your review stating we provided only a fraction of 1 day credit. You payed just over 2200 in rent, and we provided a total compensation of 500, which is the equivalent of 1.6 days. Though we understand you wanted more money - we feel you have drastically mischaracterized our attempts to make the situation right for you. Regardless - we wish you and your family nothing but the best. We had a great time in Wrighstville Beach our unit was front line, clean and well maintained. Would rent it again. My family and I enjoy coming here. We love how close it is to the beach. 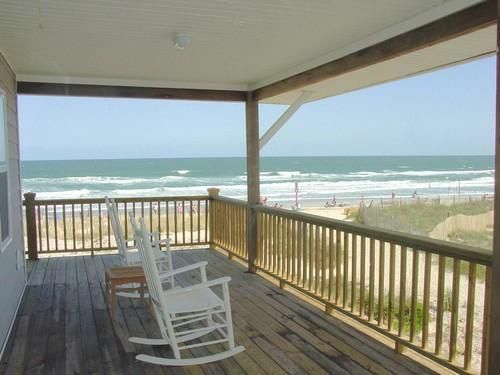 We enjoy the deck spend time reading and looking at the ocean. We go out in the early morning and after the sun goes down. This year was especially nice because my daughter was married on the beach! wish the weather would have cooperated. That was the afternoon of the big storm! I really enjoyed my stay in this area! It was comfortable and it was very homey! The only thing we needed to bring was sheets, food, towels and our personal belongings. We've stayed in this house numerous times and are always impressed by the amazing view. The house was clean and appeared to be well maintained overall. The two beds in the one guest room have bulky frames which makes the room feel a bit small and there appeared to be some water damage at both of the showers, but overall this is a wonderful house and we would definitely recommend it to others!